20160123 - Up early and L&I did our exercises. Got myself together and headed into work. L is on her own with the boys today as it is a full day of move related activities for me today. She has to get G to his basketball game and then baseball exhibition. At least D will be able to drive himself to baseball today :-) Was at work all day, existing office all morning doing desk stuff. Had lunch with the team and then headed over to the new building. Things are moving right along. The next 2 weeks will prove to be interesting... Headed home, saw D's car sitting at the hig school when I went by. Home and Lilly was left outside all afternoon, poor freezing bearded lady. L&J home to get me and we went to Max & Erma's for dinner meeting D, who drove himself, and Gma&paW with G. G blabbered about his games, both basketball and baseball today and how they destroyed both teams. Headed home after dinner and D went to meet some friends at the bowling alley, which was full so they ended up at Wendy's and then Glow Putt. 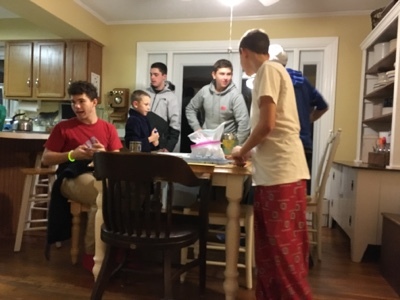 They got home and I had a little talk with D and all of his friends about driving with too many kids in the car and it was illegal, doesn't matter if it is 3 feet or 300 miles... D went to spend the night at his friends with the guys and LJG&I watched Crocodile Dundee 2 and hung out. Up late finishing the database I started today.